Prerequisite: Make sure that you read the Adapters Overview first. In order to create an adapter, you first need to download and install Maven. Go to the Apache Maven website and follow the instructions how to download and install Maven. Follow the installation instructions in the Downloads page to Install MobileFirst CLI. Prerequisite: To create adapters using the Developer CLI, Maven must be installed. To create a Maven adapter project, use the mfpdev adapter create command. You can choose to run the command interactively or directly. The “adapter-maven-archetype” is a Mobile Foundation-provided archetype, that based on the Maven archetype toolkit, and is used by Maven in order to create the adapter Maven project. To create a Maven adapter project, use the archetype:generate Maven command. Once the command is executed, Maven will download (or use the local repositories mentioned above) required files in order to generate the adapter Maven project. You can choose to run the command interactively or directly. From a Command-line window, navigate to a location of your choosing. This is also where the Maven project will be generated. The Archetype Group Id and Archetype Version are required parameters to identify the archetype. For more information about the archetype:generate command see the Maven documentation. Using the MobileFirst CLI - Run the adapter build command from the project’s root folder. Using Maven - The adapter is built each time you run the install command to build the Maven project. Replace localhost:9080 with your MobileFirst Server IP address and port number. Optional. Replace the mfpfUser and mfpfPassword default values with your admin user name and password. Optional. Replace the mfpfRuntime default value with your runtime name. The -x option deploys the adapter to the MobileFirst Server that is specified in adapter’s pom.xml file. If the option is not used, the CLI will use the default server specified in the CLI settings. For more CLI deployment options run the command: mfpdev help adapter deploy. If you run multiple runtimes, see Registering applications and deploying adapters to different runtimes. Add a lib folder under the root Maven project folder and put the external library in it. Add the library path under the dependencies element in the Maven project’s pom.xml file. Search online repositories such as The Central Repository for the dependency. Copy the POM dependency information and paste it under the dependencies element in the Maven project’s pom.xml file. For more information about dependencies see the Maven documentation. 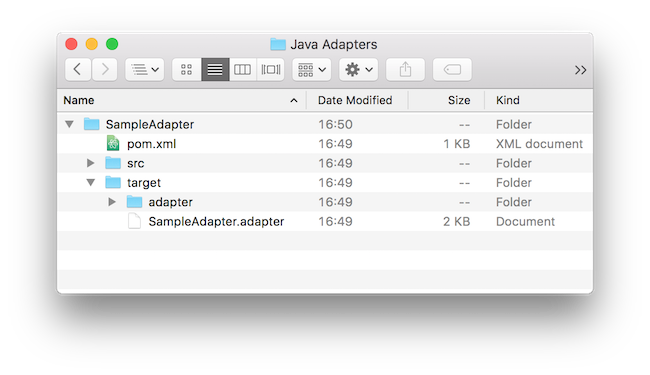 If you have several adapters in your project you may want to arrange them under a single Maven project. Grouping adapters provides benefits such as build all, deploy all and sharing dependencies. You can also build all and deploy all adapters even if they are not grouped in a single Maven project using the mfpdev adapter build all and mfpdev adapter deploy all CLI commands. Create a root folder and call it, for example, “GroupAdapters”. Put the Maven adapter projects in it. Optional. Replace localhost:9080 with your specific MobileFirst Server IP address and port number. To build or deploy all adapters, run the Maven commands from the root “GroupAdapters” project. Open your browser of choice and load the MobileFirst Operations Console using the address http://<IP>:<PORT>/mfpconsole/. Using Maven or MobileFirst CLI as previously explained above. 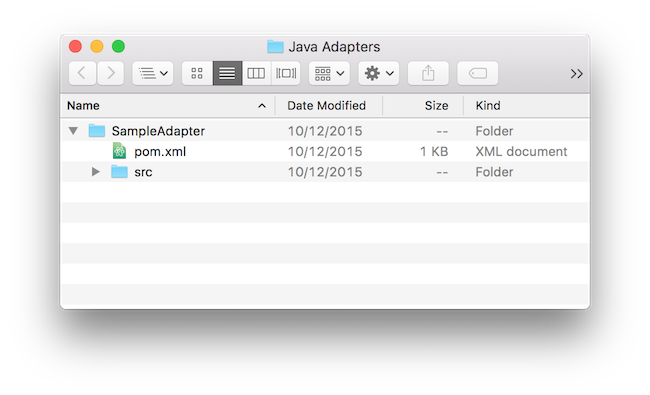 Download a template adapter project (step 2). 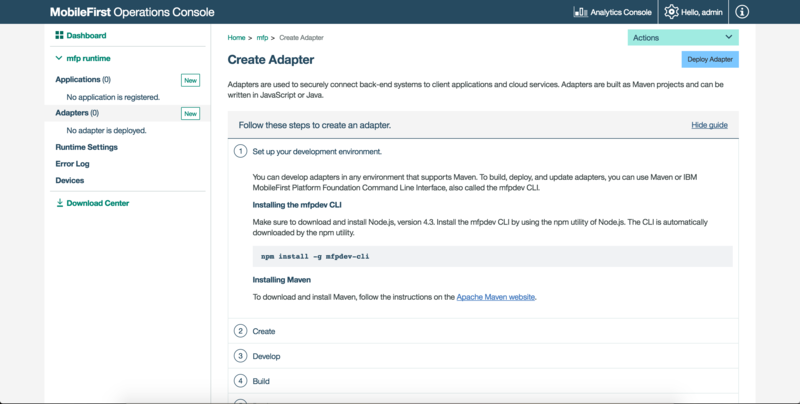 Build the adapter Using Maven or MobileFirst CLI. Click on the Deploy Adapter button (step 5). Drag and drop the file into the “Create new” adapter screen. Configurations - properties defined by the adapter XML file. Here you can change the configurations without having to deploy again. Resources - a list of the adapter resources. Configurations Files - adapter configuration data, to be used in DevOps environments. If you do not have online access to the Maven Central Repository, you can share Mobile Foundation Maven artifacts in the internal repository of your organization. Visit the Downloads page and download the IBM MobileFirst Foundation Developer Kit Installer. Start MobileFirst Server and in a browser, load the MobileFirst Operations Console from the following URL: http://<your-server-host:server-port>/mfpconsole. Click Download Center. Under Tools → Adapter Archetypes, click Download. The mfp-maven-central-artifacts-adapter.zip archive is downloaded. Add the adapter archetypes and security checks to the internal Maven repository by running the install.sh script for Linux and Mac, or the install.bat script for Windows. The following JAR files are required by adapter-maven-api. Make sure they are located either in developers’ local .m2 folder, or in the Maven repository of your organization. You can download them from The Central Repository.